Tom Hardy stars as Spider-Man’s professional-rival-turned-archnemesis in Venom, an anti-superhero movie that neither features New York’s friendly neighborhood arachnid-person nor exists in the same cinematic universe as Tom Holland’s current iteration for the Marvel Cinematic Universe. Topher Grace appeared as Venom, however briefly and frustratingly, in Sam Raimi’s second sequel to the Tobey Maguire-starring Spider-Man series, and fans have been clamoring for a proper deployment of the character ever since. Hardy gives a spirited, always-watchable, occasionally mumbling performance as Eddie Brock, the reporter who becomes the host to a brain-eating alien organism. The actor’s commitment to his Jekyll and Hyde routine is admirable, if comically absurd, as opposed to the terrifying quality usually associated with the character. But not even Hardy’s presence can distract from the script’s tired use of wisecracks, bombastic action sequences, and a complete disregard for the characteristics that made Venom a memorable character in the comics. A stand-alone feature about Venom is a desperate move on Sony’s part. 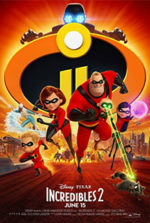 Although they own the rights to Marvel’s web-slinging hero, their last three attempts to make a Spidey movie that connected with audiences—Spider-Man 3 (2007), The Amazing Spider-Man (2012), The Amazing Spider-Man 2 (2014)—failed, quite miserably, despite making hundreds of millions at the box-office. Seemingly incapable of making a movie that pleases comic book fans, or anyone else, Sony has since loaned Spider-Man out to the MCU, along with a select few of his associated villains. Meantime, they’ve made a desperate attempt to produce a number of spin-off movies. In a cart-before-the-horse move reminiscent of Universal’s Dark Universe that began and ended with The Mummy (2017), the studio has given a lofty name to their planned movie continuum: the Sony Universe of Marvel Characters. Venom is the first of them, and it plays as though some Sony executive who’s been locked in his office since 2003 finally emerged and dictated the movie’s banal, kitschy tone and cheap-looking CGI. The result looks and feels like it’s from the same era as The Punisher (2004) and Fantastic Four (2005). The traditionally New York-centric Eddie Brock arc has been resituated to San Francisco, a move explained in a throwaway line about Brock’s renegade brand of investigative journalism getting him ostracized from the East Coast. (But really, it’s a choice meant to rationalize why Spider-Man isn’t swooping in and saving the day.) Now with some celebrity from his news show, “The Eddie Brock Report,” Brock lives a comfortable life with his fiancée, Anne Weying (Michelle Williams), a high-powered attorney. When Brock is tasked with interviewing tech mogul Carlton Drake (Riz Ahmed) as part of a puff piece, he can’t resist asking the tough questions about Drake’s shady deals and rumors of human experimentation. As a result, the vindictive Drake arranges it so that Brock loses his job. Anne leaves him too, as her firm represents Drake, and they fired her over Brock’s confrontation. And so, Brock hits rock bottom. Nevermind that in the comics he was an unhinged lowlife and bully. 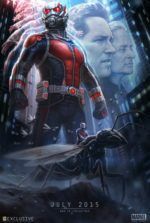 Here, he’s a strangely incongruous mixture of activism and motorcycle-riding rebel that feels like an excuse by the many-credited writers to make him a hero. At the same time, a space shuttle owned by Drake crash lands on Earth carrying several alien symbiotes—goopy slime creatures that need a host to survive. Drake hopes to achieve human-symbiote integration to allow people to explore space, and in his dastardly Elon Musk way, he’s willing to sacrifice a few homeless test subjects to achieve his vision. 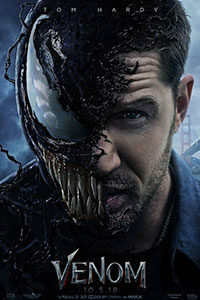 Meanwhile, a whistleblower (Jenny Slate) approaches Brock to expose Drake’s plan, and the down-on-his-luck reporter’s snooping exposes him to Venom—a black symbiote that speaks to Brock in a monstrous voice and grants him, among other advantages, super strength and a greasy organic suit with stretchy tendrils. Drake orders a group of mercenaries to capture Brock/Venom, and a series of chases, goon-bashing, and infrequent head-eating ensues. It’s all delivered with a light PG-13 quality that robs the Venom character of its potential for an alternative kind of superhero movie that splices together science-fiction and horror. 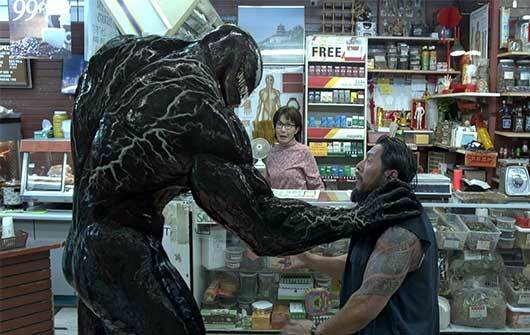 Venom spends most of its runtime with Hardy, giving little screentime or development to the characters played by Williams, Ahmed, or Slate. Not even Brock or Venom have more than two dimensions, aside from both being losers of their respective species, who then become heroes as a result of their newfound partnership. 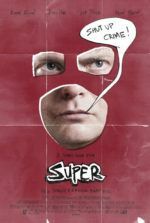 Given its disregard for the integrity and nature of the comic book property, one has to question why this movie exists. Those unfamiliar with Venom probably won’t care about the movie anyway, while casual Spider-Man fans, the target audience, are bound to feel disappointed by its treatment—doubly so after Sony messed up Venom once before. Who was Sony trying to appease, besides their investors? Because Venom looks and feels like a slapdash attempt to exploit the rights to a Sony property in the wake of the MCU, the movie apparently exists as a commercial enterprise and not much more. At least MCU titles mask their commercialism in their devotion to characters and telling a good story. By contrast, Venom seems like a knock-off, or perhaps a throwback to the early-2000s era of superhero movies that is best left forgotten.